By Dan Ambrose: The often-injured WBA/WBC welterweight champion Keith ‘One Time’ Thurman has pulled out of his May 19th fight on Showtime due to a deep bruise that he suffered to his left hand while training. It’s now official that Thurman will NOT be defending his titles on May 19th on Showtime Boxing. Thurman has been told by a doctor to rest his injured left hand for 6 weeks, according to ESPN. 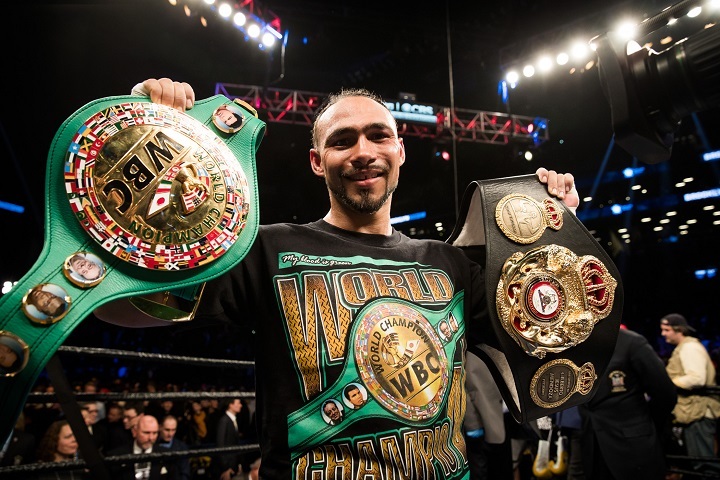 Thurman now plans on defending his WBA/WBC titles in the summer. Whether Thurman will still have his titles by that point is unclear. He likely won’t fight until July, which means Thurman will have been inactive for 16 months since his last fight on March 4, 2017. 1 ½ years is a long time for a contender to have to wait for a title shot against Thurman. Do the WBA and WBC let Thurman sit on his titles or do they strip him and have the contenders scrap it out for his belts? Thurman’s May 19th fight was due to take place at the Barclays Center in Brooklyn, New York. The only good news is Thurman’s management still hadn’t selected opponent for the May 19th fight date. Given that there was less than 2 months to go before that date, it was clear that it wasn’t going to be a dangerous opponent. The 28-year-old Thurman (28-0, 22 KOs) was planning on coming back from elbow surgery and a 14-month layoff to defend his two titles against a fringe contender, but the injury bug has bitten the Florida native once again and he was forced to pull out of the fight. There’s no word yet from the WBA and WBC if they plan on stripping Thurman of his two titles. You have to believe that at this point, both of them will strip Thurman of his straps due to inactivity. Even if Thurman’s comeback fight is postponed for 2 months, we’re still talking about a champion that hasn’t defended his tittles for almost a year and a half. It’s bad for the highly ranked contenders waiting in line for their title shots against Thurman. When you have a guy that can’t stay healthy enough to defend his titles twice a year, it slows things down. Thurman has only been able to make one defense per year since 2016. Thurman will probably be able to make his once a year defense if he is able to make it through a training camp to defend his WBA and WBC titles in 2018, but you never know. Thurman last fought in March of last year in beating WBC welterweight champion Danny Garcia by a 12 round split decision on the 4th of March in 2017 at the Barclays Center in Brooklyn, New York. Thurman had elbow surgery not long after the fight to fix a problem with his right elbow. Thurman says the problem was there before he fought Garcia. It’s unclear whether Thurman disclosed the injury to the New York State Athletic Commission before he took the fight with Garcia. It would have been nice for them to know that Thurman was fighting with an injured left elbow. A lot of boxing fans were interested in the Thurman-Garcia fight, but it turned out to be a one-sided fight in the first 6 rounds with Thurman hitting the slower Garcia at will with right hands to the head. However, in the second part of the fight, Thurman stopped throwing punches and became very defensive after getting hit hard by several booming left hooks and right hands from Garcia. Thurman took the shots, but they seemed to scare him and make him reluctant to let his own hands. Neither guy looked to be in the same class as IBF welterweight champion Errol Spence Jr. Thurman and Garcia looked like B-level welterweights fighting out for second place in the division. The boxing fans weren’t seeing the best two fighters at 147. Spence wants to fight Thurman, but he’s been inactive because of his elbow surgery and unable to fight. Perhaps now the sanctioning bodies will strip Thurman and have Danny Garcia go after the WBA title, and Shawn Porter fight for the WBC strap. That would make a lot of sense. Thurman has held the WBA 147 lb. title since 2015, and he’s defended it successfully against Robert Guerrero, Luis Collazo, Shawn Porter and Danny Garcia. Porter and Garcia are both waiting for rematches with Thurman, and they’ll likely face him once he makes his comeback at some point after getting a tune-up out of the way first. Thurman is supposed to be back inside the ring the summer, but you can be certain he’ll make it to the ring or not. Hopefully, Thurman doesn’t suffer another injury that causes him to need more time off. At some point you’ve got to figure the WBA and WBC will strip him. It’ll be forlorn if Thurman still hasn’t made a defense of his WBA and WBC belts by early 2019. Do the sanctioning bodies just freeze the titles and wait for Thurman to stop licking his wounds before he finally makes a defense, or do they strip him of his two titles?